Actually, until very recently, I didn’t really know the way. Oh, I could have found my way down the Peninsula. In fact, for about a year, I even worked in San Jose. But that was nearly thirty years ago and I used to commute on the train. So other than the route to the train station in San Francisco and the path across the parking lot to where the shuttle bus picked me up to take me to the office park where I worked, I didn’t really know the way. And I certainly didn’t know San Jose — except for a very few forays when I tagged along at lunch hour with a colleague who had a car and lived in the area. I’m finding out that San Jose was a very different place back then. Back when I worked there, most of the big employers still referred to themselves as “Fairchildren”, meaning that they were founded by alums of one of the granddaddies of Silicon Valley, Fairchild Semiconductor. There were still large tracts of farmland. In fact, Libby’s massive canning complexes were just shutting down. 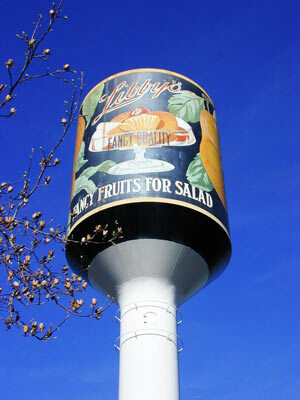 (Although the landmark water tower painted like a Libby’s fruit cocktail can — see top of post — still had its original paint.) Of course, thirty years ago America — and San Jose — hadn’t been malled over. 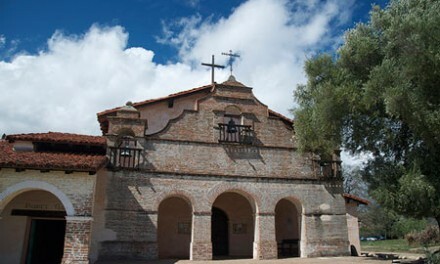 It seems to me, back then, the biggest San Jose mall was The Pruneyard which was a rambling vaguely Mission Revival style one story affair with all the stores accessed from the open air. (I’ve discovered that it’s still there, revamped and expanded, but positively quaint by today’s mega-mall standards.) Then there was Stevens Creek Boulevard, a massive multi-lane surface road that featured every single car dealer you can imagine. That’s still there, too. I remember once there was a stalker shooting in the area (the incident later made into a TV movie staring Brooke Shields). All of us in the Advertising Department, once we were evacuated to the parking lot, piled into a couple of cars and took ourselves to, what at the time to me seemed, an amazingly vast shopping center which featured about five huge geodesic dome type buildings that were the Winchester movie theaters. The parking lot alone was as large as an Olympic stadium and I couldn’t imagine anything to do with shopping being any bigger. Of course, flash forward thirty years and I’m finding almost every mall is this big. And San Jose has hundreds and hundreds of them. But hunkered down as I’ve been in relatively mall-less San Francisco and Sonoma I haven’t really been aware of how malls have gobbled up America — or at least San Jose. I’d see them in the distance from a freeway or a highway sometimes — but given my penchant for road trips on Blue Highways, back highways and roads less traveled — I didn’t see them very often. Especially in the last few days as I’ve tootled around San Jose trying to pull together our infrastructure — the dry cleaner, the pet hospital, the grocery store, etc. etc. — I’ve seen more malls than I’ve probably seen in thirty years. All connected with freeways and expressways. Which is the biggest culture shock I’m experiencing. After most of my lifetime spent walking to shops or poodling along at 15 MPH in the car, I’m having a hard time dealing with the fact that I seem to have to get on a freeway and drive 65 MPH to get a cup of coffee or buy some salad fixings. 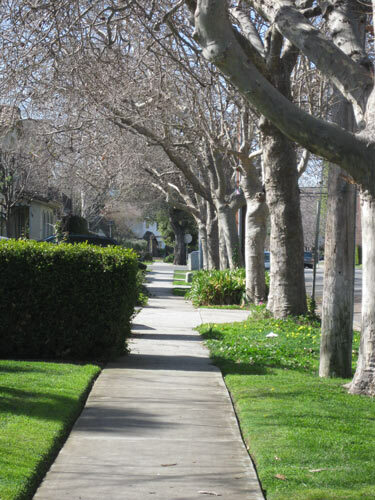 Older neighborhoods in San Jose are surprisingly walkable — with little one-story bungalows, tiny manicured front yards and tree lined streets. 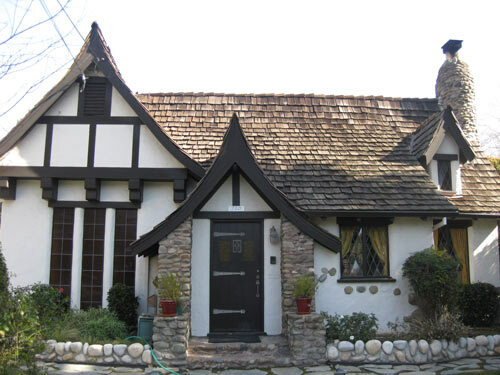 Many of the houses are positively hobbity. 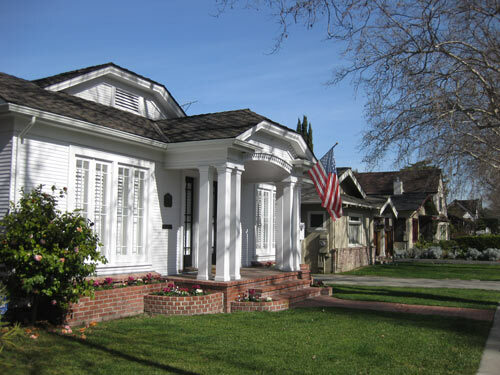 Then there are the pseudo Spanish Revival bungalows that look as if they belong to a rare race of Mediterranean hobbits. Charming. At least in some neighborhoods, it seems you could map out several miles of running trails under old growth trees and near manicured lawns. But look, everyone disses San Jose. Or at least San Francisco does. For hundreds of years, when San Jose was fruit orchards and Los Angeles was a dusty outback, San Francisco was the only city in California. Those of us who’ve lived in San Francisco a long time still call it The City (capital letters) as if there were no other. And many of us look down on San Jose — even though we are tiny — albeit more densely populated — by comparison. Still, we are happy to annex their population stats if we want to inflate our U.S. metropolitan standing or claim ourselves as the capital of high tech innovation. Heck, years ago I attended a Silicon Valley charity event where Burt Bacharach was the headliner. 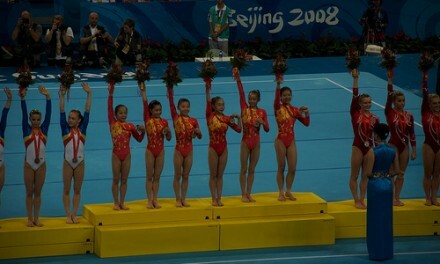 The organizers called it “The Way to San Jose”. Only to find that Mr. Bacharach was completely snippy about the appropriation of his song title — to the point where he refused, despite repeated requests and begging from the audience — to sing the song at the event. Like I said, San Jose can’t get no respect. I’ve noticed a slight chip on the shoulder attitude down here as I tell people I’ve lived in San Francisco for thirty years and am now about to be a part time San Jose resident. They are expecting the snobbery. But, as a lifelong traveler, I’ve always believed you can find something exciting about any place — even if you are appalled at some of the particulars (or perhaps the reverse such as the glories of France contrasted with the disgusting state of their public rest rooms.) So I’ve made sure to tell the custodians of my new San Jose infrastructure of the things I’m liking about San Jose. As the nice lady at the dry cleaner said, “I think you’ll find San Jose has a lot to recommend itself.” And it does! 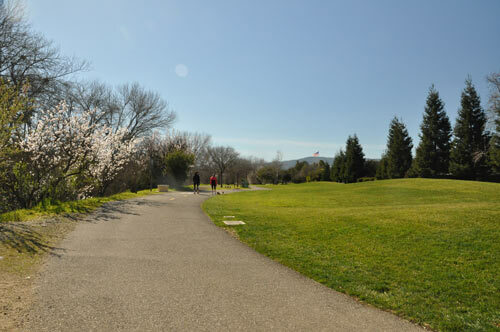 You’d never know you were half a mile from several freeways as you walk or jog for miles and through several cities along the Los Gatos Creek Trail. *Yes, it let growth get out of control. But a combination of geography and good sense seems to be saving it in the nick of time. 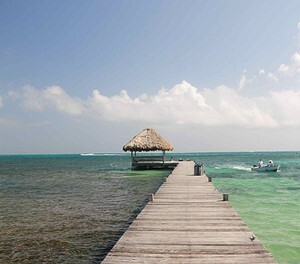 The area is surrounded by mountain ranges that aren’t easily malled over. So San Jose grabbed them up and made urban parks and open spaces which offer a huge network of really rural hiking trails all a short hop from anywhere in the city. Ditto the several rivers and main seasonal creeks in the area. Before asphalt could be poured over the Guadalupe River or the Los Gatos Creek, San Jose snatched them up and swung innovative cooperative deals with other nearby cities so that you can walk or jog more than ten miles on beautiful paths along rivers and through several towns without even realizing there is a freeway on the other side of that thicket of brush that protects the path. *When San Jose built its international airport, the flight path went right over the original historic downtown. Consequently, FAA height restrictions have kept that downtown low profile and retro looking. *Somehow, despite being California’s third largest city, San Jose’s people still sport a Western town vibe — at least if you count the number of people who smile and say howdy as you walk by. *Plus — as readers of this blog know is dear to my heart — San Jose seems to have more than its fair share of weird and wacky history. From the Rosicrucian Museum (founded by a shadowy group that seems to be a cross between Scientologists and Freemasons) to the Winchester Mystery House (which the daughter of the man who made the Winchester repeating rifle built to protect herself from the ghosts of the people killed by the gun) to the fact that the survivors of the Donner Party, who lived through Hell and wanted to claim a little piece of Heaven, all seem to have settled here. So here’s my plan. I’m not sure how much time I’ll spend in San Jose once winemaking season calls me to Sonoma, but until then, I plan to ferret out and report all the interesting things I find to do, see or explore in San Jose. See, I’m getting to know the way. Of course, Dionne Warwick will have to sing the theme song to my explorations. But the song was actually a huge international hit, charting in France, Sweden, Germany, South Africa and many other countries — who have at least heard of San Jose even if they don’t all know the way. How about a German version which roughly translates to “The Coffee is Hot in San Jose”? The city of SJ should enjoy your complimentary post. I enjoy the unusual things you seem to discover wherever you go. “Old growth” is a bit of a stretch though. Glad you are exploring your new city to our benefit. There are worse things to be than overlooked. If they date from the 1800s don’t they count as “old growth” for street trees? I’m not sure of the perameters for “old growth”. Those trees just don’t seem that old to me. Interesting. I must do some research. I guess it depends on the tree. In San Francisco we have a bottlebrush tree in front of our house. It’s supposed to have a 40 year life span. It was at least 15 years old when we moved in nearly 30 years ago, so I guess that would be old growth. And we actually wish it would die because it’s the worst kind of tree for an urban environment — shallow roots that pull up the sidewalk every ten years rather than a tree with a long deep taproot. At this point, it’s got to be the oldest living bottlebrush in California! And the City won’t let us cut it down and plant something more appropriate until it dies a ‘natural’ death. Simply water in a good deal of rock salt into the drip line of the tree you want to die. Shhhh! I won’t tell. If I can do anything to help you rise up against the nutty rulers of San Francisco I’m delighted to help. Normally, I would agree with San Francisco’s desire to protect as many street trees as possible. But this crazy tree lifts up the sidewalk every ten years — which we have to pay to repair. Because the tree is NOT ours to cut down, but any damage it does is ours to repair. But at more than 40 years old, this tree has lived a good long life for its species. I’ve sworn, if they’ll let us cut it down, to replace it immediately with a more appropriate tree with a long tap root that won’t pull up the sidewalk. No dice. I’ve got to wait for it to die naturally. But it seems to be the immortal vampire Bottlebrush tree.